Over the last few years, residential properties generating their own solar power for home use has increased by 30-40%. This is without government subsidies, as 75% of New Zealand’s energy is already produced from renewable resources, yet very little of this is from solar power, instead being generated through hydroelectric projects. The national trend of ignoring the potential for solar power in energy generation is surprising, considering the regular hours of sunlight New Zealand (especially Northland) is blessed with. It is not a trend that has been upheld by New Zealand home owners. This is not a surprise, considering the average household energy bill, which amounts to over $2,000 a year. In 2012, over $2.8bn was spent by households on their electricity, accounting for 12% of New Zealand’s total expenditure (New Zealand Energy Data File). The attraction in installing photovoltaic panels (PV), or solar panels as they are more commonly referred to, is clear; generating clean, renewable energy that both reduces residential energy bills and provides a potential source of income. Does the reality match the hype? The rapid recent increase in the adoption of PV solar power systems for homes in New Zealand is down largely to the reduction in installation costs. The mass production of PV panels has reduced the price of home solar power systems, whilst improvements in the technology itself has far simplified the installation process for home systems. These two reasons have meant that the price of installing solar power systems has become affordable to homeowners, with a financial return on investment coming must faster than in previous years. The vital question to consider when looking into a home solar power system is simple; is a solar power installation at home the best way to reduce energy costs? It is important to remember that there are two distinct type of home solar power systems; stand-alone systems and grid-tied systems. Both systems are technologically similar, with both using PV panels to convert the sun’s rays into energy. The difference comes in where the energy produced goes. Stand-alone systems store energy that isn’t immediately used in a battery for use later, whilst in a grid-tied solar power system, excess energy is sold back to the supplier. Stand-alone home solar power systems are hugely attractive in theory, and for remote properties, away from the national energy grid, can work wonderfully well. However, the energy produced is more expensive than the energy produced in a grid-tied system, and there is a real risk that the home may use more energy that the system produces at times. To ensure that your home does not run out of energy when using a stand-alone home solar power system, extra investment must be made in both ensuring your home’s energy efficiency and a backup energy supply, for example, a generator. New builds designed to be completely off grid, or remote residential properties can work extremely well using stand-alone solar power systems in Whangarei and Northland, but the majority of conversions to PV panel solar installations are Grid-Tied. 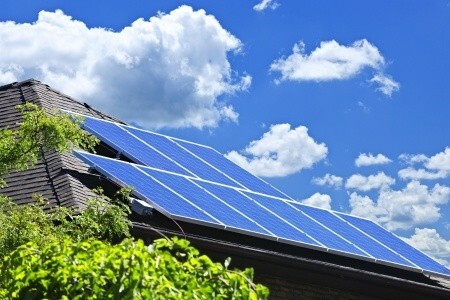 The power generated by a home solar power system can be used to power the home, with any excess energy generated being sold back to the energy supplier. These are known as grid-tied home solar power systems. Grid-Tied home solar power systems require much less financial investment to start with. There is no requirement to install a back-up energy system for those grey days. Your home is still connected to the national energy grid, but energy is only consumed if the demand outstrips the energy produced from the PV system. A grid-tied home solar power system is a long term investment. The cost of a solar power system and its installation, although much cheaper than a few years ago, still represents a considerable expense, usually in the region of $6,000 – $10,000, (some banks offering specific loans to help cover the installation costs). However, from the moment the system is installed, the savings start. The rate depends on the difference between the amount of energy produced and the amount used in the home. If the household uses less than the home PV system creates, the saving are in terms of energy bill reduction, but if the system produces surplus energy to the home’s requirement, energy bills are cut out and the excess can be sold back to the supplier for as much as $0.25 per KwH. At that rate, with average energy bills of $2,000 a year, many systems can be completely paid off within 4-5 years. The price power companies will buy back excess electricity varies, and is key in the financial calculations on the viability of installing a home solar power system. It is important to understand the prices paid. Net Billing or Net Metering is the most attractive offer from power companies, where the energy bought from the grid costs the same as excess energy is bought back for. Although this is not as freely available as owners of home PV systems would like, it is still available in Northland and Whangarei. More common however, are companies buying back excess energy at wholesale prices, or at scaled prices, for example, Meridian’s offer of $0.25 paid for the first 5KwH each day, with every KwH after that being bought at $0.10. Prices of $0.17 per KwH or more are an attractive prospect (Consumer Magazine 2013). How much energy will a Whangarei home PV system generate? To get a clear estimate of the amount of energy a home solar power system will make, a PV installer should be called to do a site visit. They will be able to generate an accurate estimate of the amount of energy that could be generated on a specific site as size, aspect and relief all have a significant impact on the amount of energy a home solar power system might generate. In general however, a single PV panel at peak capacity will generate 1Kw of energy per hour. This means that a PV panel with a 1KW capacity could produce up to 8Kw on a perfect day. (Annually, this would be more like an average of 1,825KwH per year or, at $0.17 per KwH, $310 per panel). These are not exact numbers. The amount of energy produced is directly correlated to the intensity of light which strikes the cells. Cells work best in direct mid-day sun, but will also generate some energy during cloudy days, as well as in the early morning and evening light when ambient, not direct light will strike the cells. If the property has a large, North facing roof or an area of north facing land available for the installation of a home PV system, it is likely that the numbers will work very favourably. As mentioned however, in order to get an accurate understanding of the potential return on investment, it is advisable to get a PV installer to do a site survey first. Good quality home PV systems last up to 30 years, meaning that over the lifetime of the system, some considerable returns can be made, though the exact numbers are impossible to calculate exactly as the price of energy over that period is almost impossible to predict. If the power supplied by the grid is paid for at commercial rates and the surplus energy bought back is at wholesale rates, it is important that a home solar power system provides as much of the home’s energy as possible, rather than trying to sell as much as possible back. This can be done through seemingly over-simplistic methods; only run non-essential appliances (like a dishwasher) when the sun is shining! This means that the energy used is ‘free’, saving the full $0.25 per KwH, rather than selling the same energy at a lower cost. Studies by New Zealand’s Energy Efficiency & Conservation Authority (EECA) have shown that some 59% of household energy is used in heating, with 30% on water and a further 29% on heating space. These are considerable expenses, and though the common consensus is that heating at night is cheaper when the energy supplied comes from the grid, by heating during daylight hours via a home solar panel system, the lion’s share of your heating bill can be covered using the energy produced via the PV system. A PV system is a long term investment. However, it does not tie you to the property for 30 years. The added value to a property of having a PV system installed in Whangarei and Northland is currently estimated by upwards of $250/month savings adding thousands of dollars to the value of the property, meaning that a system can be a valuable short term investment almost immediately. There are many other ways to reduce your power bills that can be implemented when you install solar power. Potter Electrical can help you with all these cost effective power savings measures.